The Illinois Soybean Association (ISA) represents 43,000 soybean producers in Illinois. 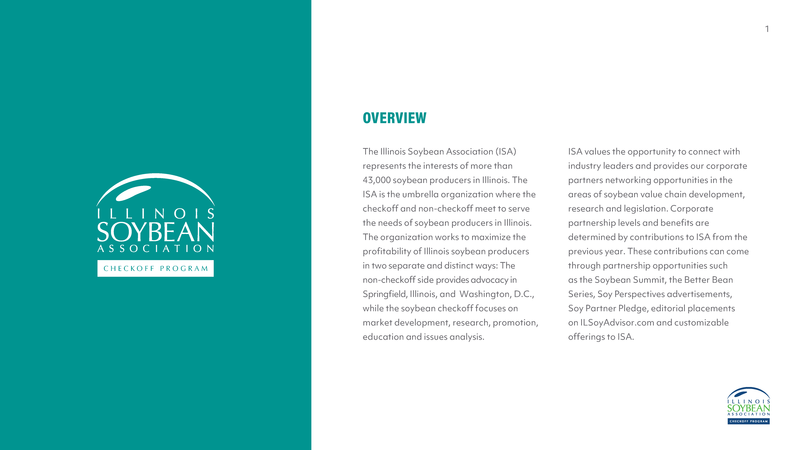 The ISA is the umbrella organization where the checkoff and non-checkoff meet to serve the needs of soybean producers in Illinois. The organization works to maximize the profitability of Illinois soybean producers in two separate and distinct ways: The non-checkoff side provides advocacy in Springfield, Illinois, and Washington, D.C., while the soybean checkoff focuses on market development, research, promotion, education and issues analysis. 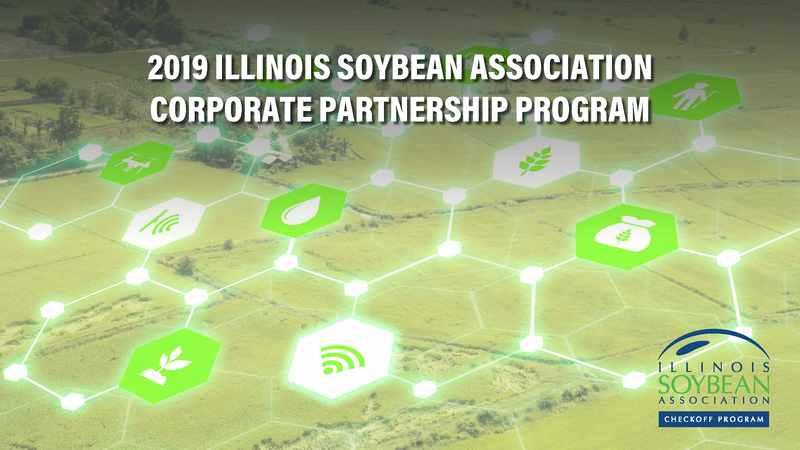 ISA Values the opportunity to connect with industry leaders and provides our corporate partners networking opportunities in the areas of soybean value chain development, research and legislation. Corporate partnership levels and benefits are determined by contributions to ISA from the previous year. 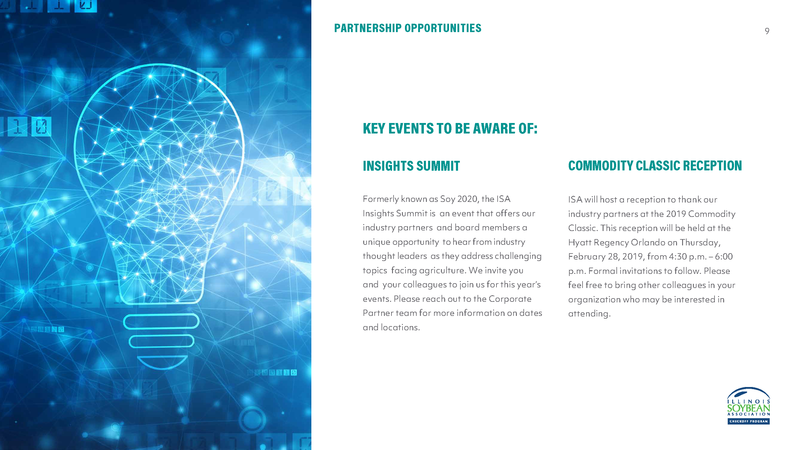 These contributions can come through partnership opportunities such as the Soybean Summit, the Better Bean Series, Soy Perspectives advertisements, Soy Partner Pledge, editorial placements on ILSoyAdvisor.com and customizable offerings to ISA. 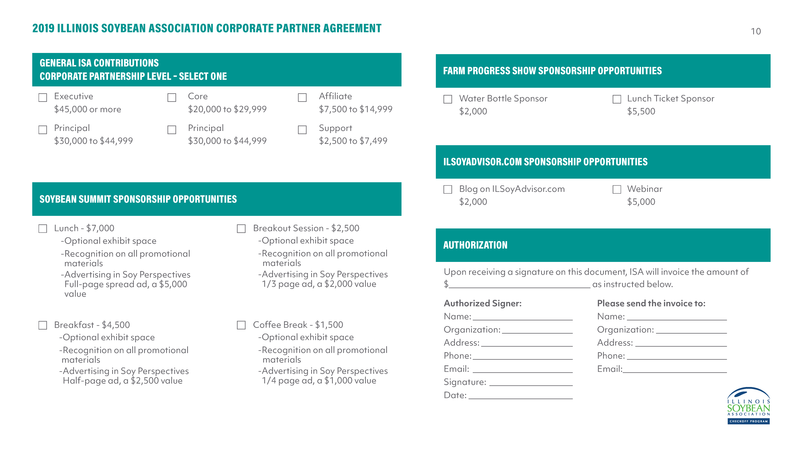 Achievement of each level can include the sum total of your partnerships with ISA such as Soybean Summit sponsorships, Soy Partner Pledge, paid advertising and other contributions. Photos courtesy of the United Soybean Board and the soybean checkoff. 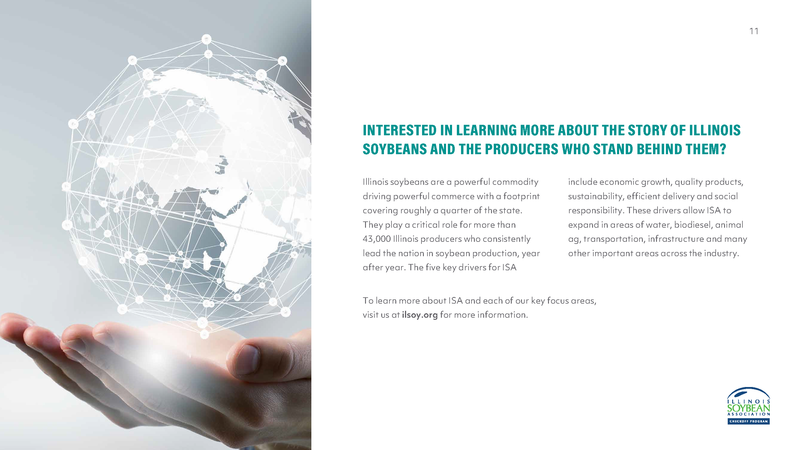 Soy Perspectives is published eight times a year on behalf of the ISA, reaching more than 43,000 of Illinois’ most progressive soybean producers and key influencers. 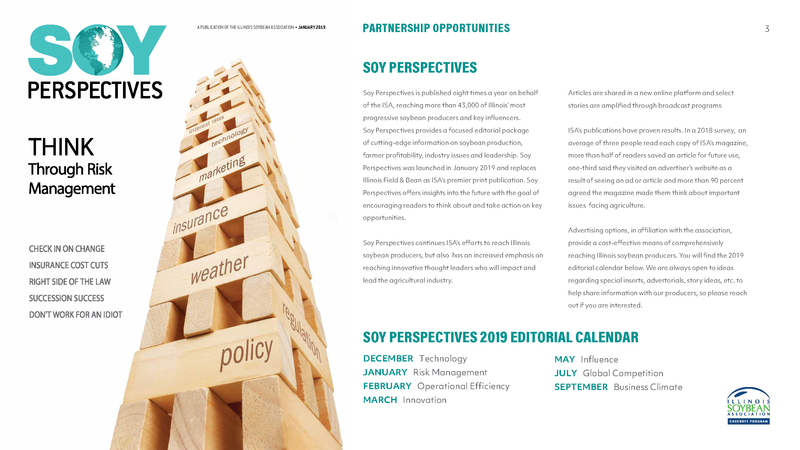 Soy Perspectives provides a focused editorial package of cutting-edge information on soybean production, farmer profitability, industry issues and leadership. 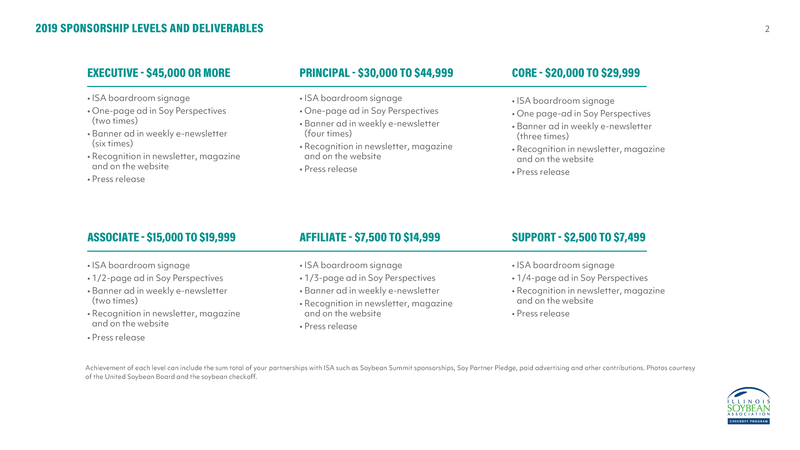 Soy Perspectives was launched in January 2019 and replaces Illinois Field & Bean as ISA’s premier print publication. Soy Perspectives offers insights into the future with the goal of encouraging readers to think about and take action on key opportunities. ISA’s publications have proven results. In a 2018 survey, an average of three people read each copy of ISA’s magazine, more than half of readers saved an article for future use, one-third said they visited an advertiser’s website as a result of seeing an ad or article and more than 90 percent agreed the magazine made them think about important issues facing agriculture. Advertising options, in affiliation with the association, provide a cost-effective means of comprehensively reaching Illinois soybean producers. You will find the 2019 editorial calendar below. We are always open to ideas regarding special inserts, advertorials, story ideas, etc. to help share information with our producers, so please reach out if you are interested. This year’s Soybean Summit will focus on marketing in times of tariffs and low commodity prices, while also focusing on the race to gain efficiency through technology and innovation. ISA will host the 2019 Soybean Summit in Springfield, Illinois, on February 5, 2019. Participants will leave with new insights into how to maximize production, effectively market their soybeans and maximize ROI through new technologies that may create efficiencies on their farms. Corporate partners have the opportunity to display their newest tools and technology to participants during the trade show portion of the event. 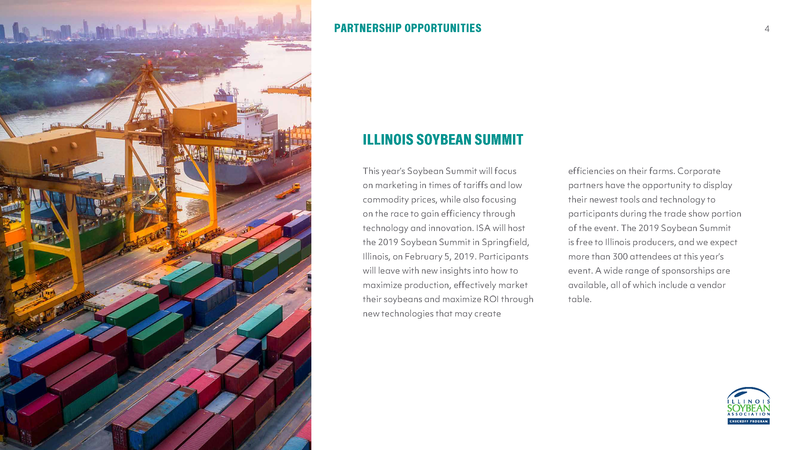 The 2019 Soybean Summit is free to Illinois producers, and we expect more than 300 attendees at this year’s event. A wide range of sponsorships are available, all of which include a vendor table. 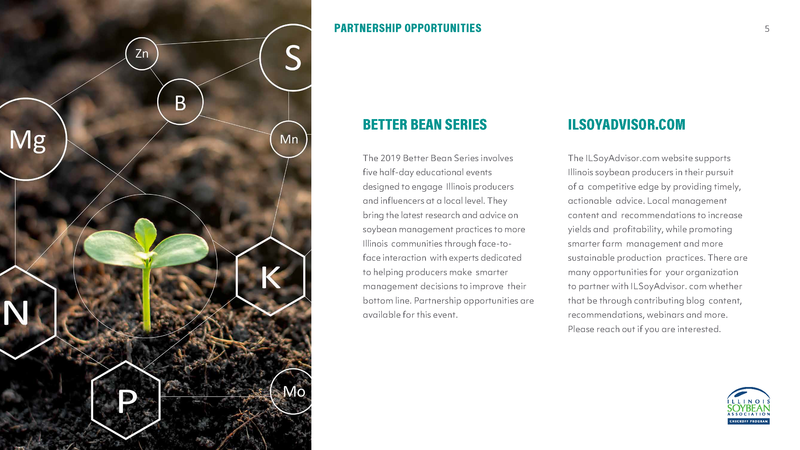 The 2019 Better Bean Series involves five half-day educational events designed to engage Illinois producers and influencers at a local level. They bring the latest research and advice on soybean management practices to more Illinois communities through face-to- face interaction with experts dedicated to helping producers make smarter management decisions to improve their bottom line. Partnership opportunities are available for this event. The ILSoyAdvisor.com website supports Illinois soybean producers in their pursuit of a competitive edge by providing timely, actionable advice. Local management content and recommendations to increase yields and profitability, while promoting smarter farm management and more sustainable production practices. 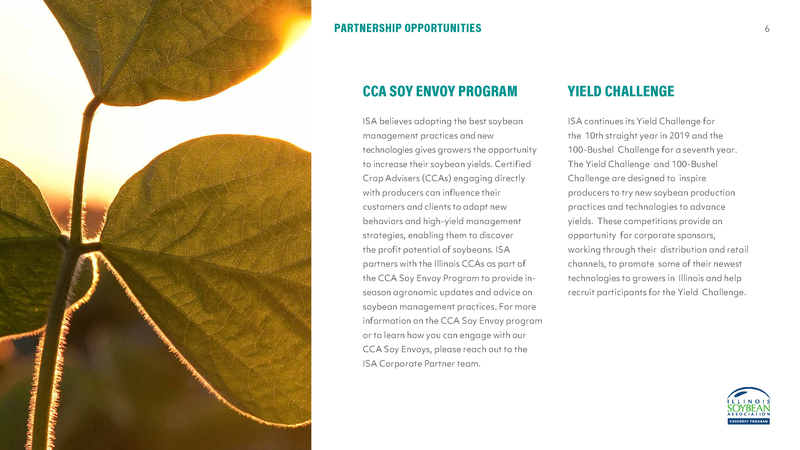 There are many opportunities for your organization to partner with ILSoyAdvisor. com whether that be through contributing blog content, recommendations, webinars and more. Please reach out if you are interested. ISA continues its Yield Challenge for the 10th straight year in 2019 and the 100-Bushel Challenge for a seventh year. The Yield Challenge and 100-Bushel Challenge are designed to inspire producers to try new soybean production practices and technologies to advance yields. These competitions provide an opportunity for corporate sponsors, working through their distribution and retail channels, to promote some of their newest technologies to growers in Illinois and help recruit participants for the Yield Challenge. The 2019 Farm Progress Show, the nation’s largest outdoor farm show, will be held in Decatur, Illinois. ISA will have a presence at this year’s show and sponsorship opportunities are available. The sponsorships will include pre-show promotion and show signage in the ISA tent. 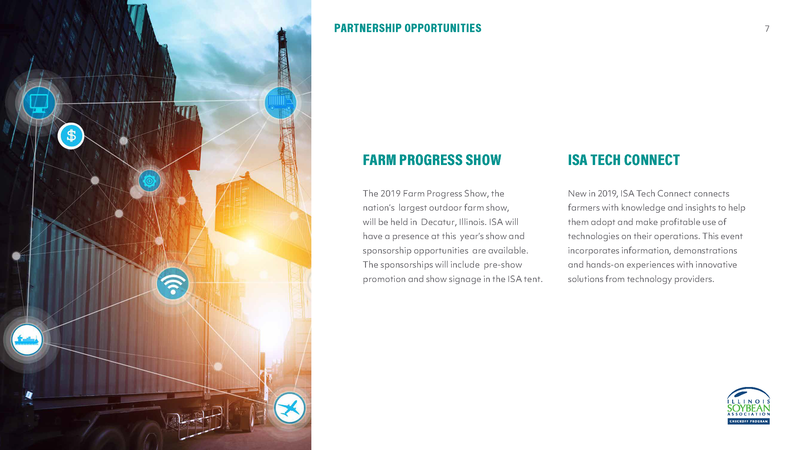 New in 2019, ISA Tech Connect connects farmers with knowledge and insights to help them adopt and make profitable use of technologies on their operations. This event incorporates information, demonstrations and hands-on experiences with innovative solutions from technology providers. With our state and nation’s failing infrastructure, increasing regulatory policies and a need for a better business environment, more advocacy for Illinois agriculture is critical. However, the ISA, by federal law, is not allowed to utilize soybean checkoff dollars for advocacy efforts. For ISA to continue these critical efforts, we need additional financial commitments. 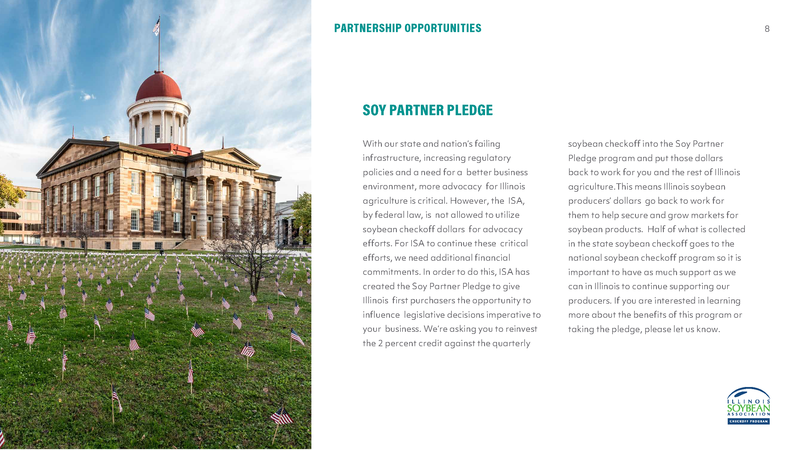 In order to do this, ISA has created the Soy Partner Pledge to give Illinois first purchasers the opportunity to influence legislative decisions imperative to your business. We’re asking you to reinvest the 2 percent credit against the quarterly soybean checkoff into the Soy Partner Pledge program and put those dollars back to work for you and the rest of Illinois agriculture.This means Illinois soybean producers’ dollars go back to work for them to help secure and grow markets for soybean products. Half of what is collected in the state soybean checkoff goes to the national soybean checkoff program so it is important to have as much support as we can in Illinois to continue supporting our producers. If you are interested in learning more about the benefits of this program or taking the pledge, please let us know.